In yet another example of how the current political fashion to try to force housing to magically appear, by piling on requirements, taxes and fees, has utterly failed, the Commerce Department reports that housing starts fell 5.3% to a seasonally adjusted annual 1.201 million rate in September. This sideways to down trend in housing starts is consistent with the overall housing starts’ trend since about 2013. 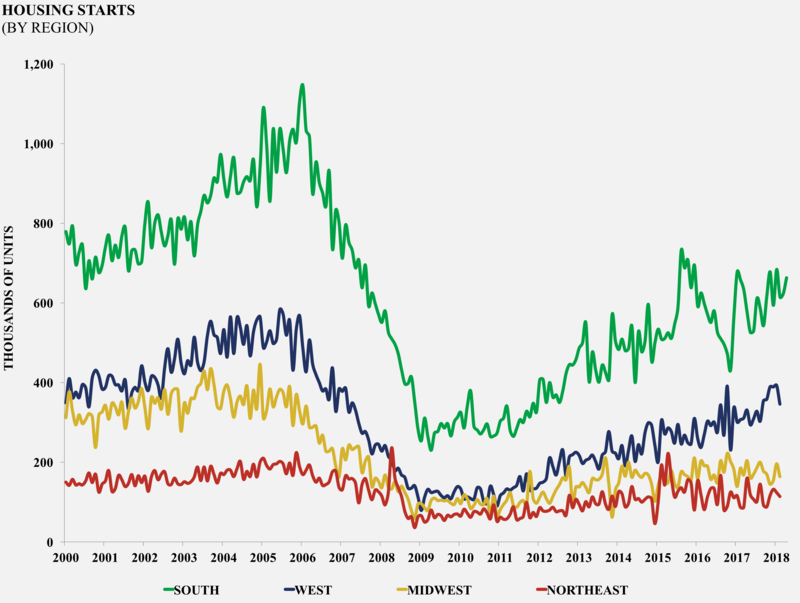 The chart for California is generally the same as the national trend, with housing starts currently being less than half the average of the 2001 to 2007 time period. We’re not just talking about special areas such as the San Francisco Bay Area, either. These trends are consistent across the entire country. So, what gives? If there is so much demand for housing and since we’ve just spent a decade living in the lowest mortgage interest rate environment in the past 50 years, why aren’t builders making the investment in building more homes? If one believes in markets at all, you’d have to conclude it’s because they don’t believe there are enough buyers to pay the price of what it costs to build those homes. The conventional wisdom in California, is that housing demand is voracious and the lack of housing is all the fault of evil local zoning and local government planning departments and the even more evil “single family homeowners,” who are categorically labeled as “rich” and “racist,” regardless of their income or race. However, what all this actually points to is the simple fact that people just can’t afford to buy a home. They can’t afford it even with historically low mortgage rates and boatloads of buyer incentives. Why? Because, the inflation adjusted income of the average American family has been dropping since the 1980s. The class wealth disparity, particularly in major cities, is also so far out of whack from historical norms that it is driving all household spending trends. Addressing this imbalance is another story that involves looking at the impacts of technology, educational opportunity, the speed of change and much more. However, in general, it suggests that the “housing crisis” is really an “income crisis” and indicates that this is where we should be putting our efforts and energies. Perhaps, the much lauded “gig” economy is just a fancy word for being semi-employed. So, if we are presently looking at a housing production peak, what will it look like during the next economic downturn, which is likely to begin as soon as 2019? It’s time our state legislature and regional housing agencies woke up to the reality of markets and economic fundamentals. As it is, they are very close to killing the goose that laid the golden egg that pays their salaries.